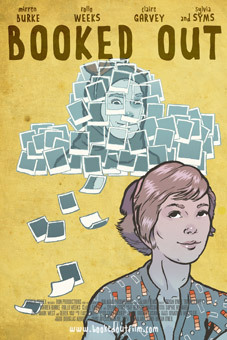 Ailidh (Mirren Burke) has two loves in this world: spying on her neighbours and writing graphic novels. The arrival of Jacob (Rollo Weeks – Girl with a Pearl Earring), inspires Ailidh and she soon begins conjuring up increasingly elaborate plans to bump into him. Upstairs, Mrs Nicholls (Sylvia Syms – The Queen) provides Ailidh with a perfect opportunity and she soon has Jacob teaching Mrs Nicholls dead husband French. Unfortunately, Ailidh's romantic endeavours are disrupted when she realises she isn't the only girl in Jacob's life. Featuring compelling performances from an exceptional cast of actors, the debut feature from Bryan O'Neil is a funny, unique and heart-warming story of love, life and moving on. Booked Out is the debut feature by Glaswegian filmmaker Bryan O'Neil, and stars 3-time BAFTA nominee Sylvia Sims, Rollo Weeks, and newcomers Mirren Burke, and Claire Garvey. Booked Out will be released in UK cinemas thoughout March 2012, and on UK DVD and Blu-ray on 12th March 2012 by (we think – it's hard to be sure from the press release) by the film's own production company Bon Productions at £9.99 for the DVD and £12.99 for the Blu-ray.